Are you worried that your cat might have cancer? Read all about how cancer is diagnosed in cats, and how your cat can be treated for cancer. Vet Dr Bradley Viner tackles one of the scariest health conditions in any species. Cancer is not just one disease, but rather a disease condition where certain cells within the body multiply out of control. It is the second most common cause of death in cats over five years of age, at 12.3 per cent of cases, compared to kidney disease, which accounts for 13.6 per cent of deaths. For cats of all ages, it is the third most common cause at 10.8 per cent. Cats are unusual in that one of the major causes of their cancers is a virus — feline leukaemia virus (FeLV). As the name suggests, this virus may trigger a cancer of the white blood cells, which can either affect only the bone marrow or the bloodstream itself, or can cause cancerous lumps to develop around the body, particularly in the lymph glands. We’ve had a vaccine to control FeLV infection for over 20 years, and as a greater proportion of the UK pet cat population has become protected, the incidence of the virus has dropped to around one per cent — far lower than before the vaccine became available. We know this significantly reduced the incidence of cancers related to FeLV infection, but we don’t have the figures to show how that has changed the overall pattern of feline disease, as detailed ‘big data’ analysis has only become available recently. Why are cats still dying of cancer? The likelihood of the normal control mechanisms going wrong in an individual cell is influenced by many factors, such as the presence of carcinogens — external agents which interfere with the normal process, such as viruses, radiation, and certain chemicals — as well as increasing age, and so potentially cancerous cells are produced all the time. The effectiveness of the animal’s immune system in quickly identifying and destroying rogue cells is crucial, and is influenced by many factors, such as diet, stress, and concurrent disease. Whether any animal develops cancer hangs constantly in a balance between the rate at which his body produces potentially cancerous cells, and the rate at which his immune system is able to mop them up. While cancers all share this underlying cause of uncontrolled cell growth, one major difference is the degree of malignancy — the likelihood that a particular growth will invade local tissues, or spread to other parts of the body (a deadly process called metastasis). The term ‘cancer’ implies that a growth is at least potentially malignant, as opposed to a benign tumour, which will gradually enlarge but remain discrete. Just as in humans, veterinary medicine has taken giant leaps in recent years to diagnose and treat life-threatening tumours. How is cancer diagnosed in cats? The first steps in treating any cancer are to identify it and establish its nature. The chances of a successful outcome may be significantly greater if the problem is diagnosed and treated as early as possible. 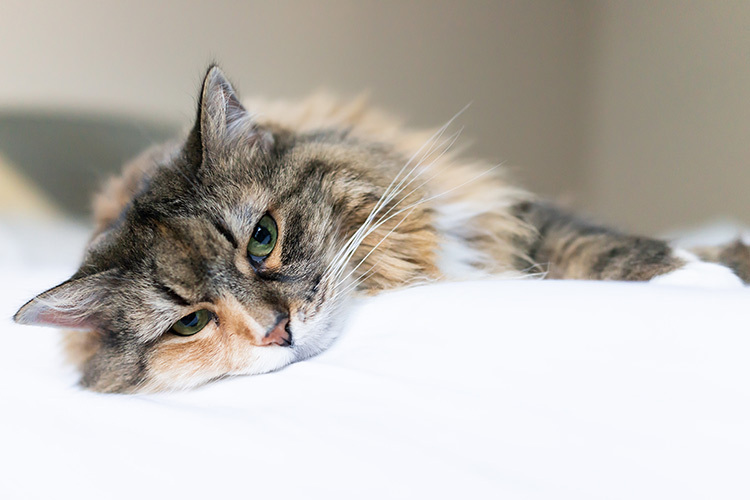 All too often, an owner suspects that their cat may have cancer and delays seeking veterinary advice because they fear the possible diagnosis. Some cancers are identifiable as obvious lumps, particularly those on the skin, although abnormal swellings may also be detectable in other areas, such as the mouth, or the abdomen of a thin cat. Other internal masses may not be so readily detectable, and upon clinical examination, it is only possible to infer their existence by associated signs, such as excessive and sudden weight loss, or — in the case of chest masses — abnormal breathing. With internal tumours, it is often necessary to carry out further diagnostic imaging, such as the use of ultrasound or radiography to detect them. Wherever a cancer is situated, once it has been localised, it is necessary to sample it to identify its type. The most suitable line of treatment is a biopsy, which may involve simply sucking cells out of the mass using a syringe and needle, but more often means cutting into the tumour under anaesthetic. How can I treat my cat for cancer? There is a range of different treatments for cancer, which may be used individually or sometimes in combination. The choice will depend upon the nature of the tumour, the facilities available, and the wishes of the cat’s owner. Surgery — with many types of cancer, there is one good chance of curing it with surgery, but that operation needs to be sufficiently radical to ensure that all cancerous cells have been removed. Owners are often shocked by the size of incision when potentially cancerous tumours are removed, but many tumours invade surrounding tissues without being visible, so a margin of normal tissue is always removed along with the mass, if possible. Repeated surgery once a tumour regrows will always carry a much worse outlook than if a cancer is completely removed at the first attempt. Chemotherapy — drugs are commonly used to treat cancers in cats because they can be very effective against the most common feline cancer, lymphosarcoma, although they are increasingly being used against other cancers as well. In humans, their use is often associated with severe side effects because they are used in high doses to try to bring about a complete cure. In cats, we generally aim for remission rather than cure, and it is often possible to give a cat a very useful, extra lease of life of a couple of years or more, without causing much in the way of side effects. Radiotherapy — this can only be carried out in centres which have access to specialised facilities, and usually involves irradiating a tumour with high-energy radiation, targeted as closely as possible upon the affected area. However, it will invariably cause some damage to associated healthy structures. This is particularly useful for the most common form of skin cancer in cats, squamous cell carcinoma. This tends to affect the nose and ears, especially of white cats, and although it is very prone to spreading locally, it does not tend to spread to other parts of the body. It is very sensitive to radiotherapy, so if used alone or in combination with surgery, it can often result in a complete cure. Sometimes a mass is treated with radiation by other means, such as the implantation of small radioactive rods into the tumour itself, known as bradytherapy. Palliative care — while treatment should always be explored as an option for cats with cancer, the option to keep the cat comfortable and euthanise him when he begins to show any signs of distress is often perfectly reasonable. As vets, we are fortunate that we can ensure our patients have an easy death, rather than having to suffer in their final days or weeks. Some cancers become infected, and antibiotics can be used to control that; the effect of the tumour itself may be magnified by an area of inflammation around it; drugs can reduce this, and painkillers can be used to help maintain a good quality of life. The decision to end a cat’s days should be a joint one between the owner and the supervising veterinarian, and should be guided by the welfare of the patient.